Core technologies and capabilities that drive the economies take a long time, large amounts of money and even bigger patience to bear fruit. But once they mature, the rewards are well worth the effort. Malcolm Gladwell in his book “Outliers” makes a similar case for outstanding achievers, that it is more of their earlier start than their brains that make them excel. It is sustained practice of ones art or profession that over the period of time blossoms into an unsurpassed ability. Developing countries typically try to shy away from making investments in longer gestation technologies and therefore commit themselves to the path of perpetually playing catchup with developed countries. This is a story of a jet engine that propelled Air Forces possessing it into an unrivaled position. In 1952, Gerhard Neumann, a German-born US-citizen, began development of what became one of the most successful military jet engines to enter production. The General Electric J79 was the first US single-shaft high performance axial flow turbojet, with adjustable guide vanes, a 17-stage compressor, three-stage turbine and ten can-type burners. The first flight of the engine was on 20 May 1955 where the engine was placed in the bomb bay of a J47-powered B-45C . The J79 was lowered from the bomb bay and the four J47s were shut down leaving the B-45 flying on the single J79. The J79 was developed as an outgrowth of the General Electric J73 engine program and was known at first as the J73-GE-X24A. 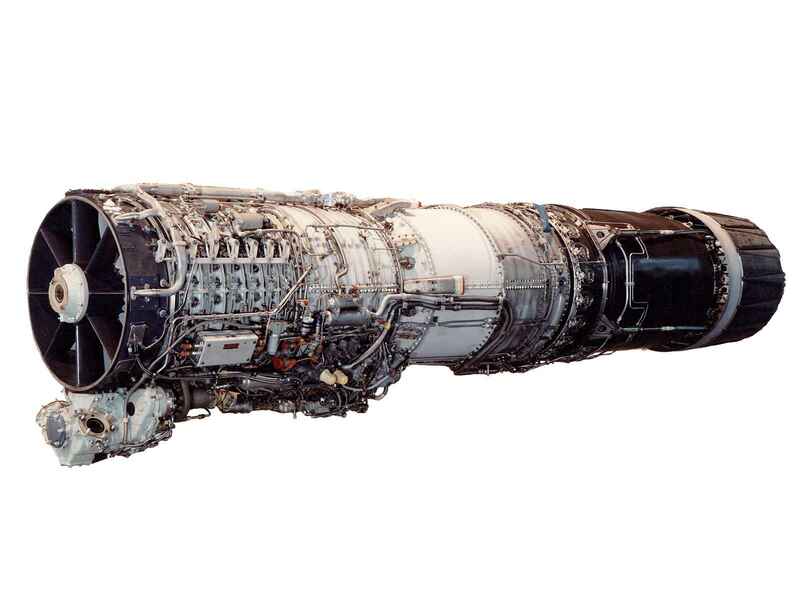 The X24A was designed for reliable Mach 2 performance with minimal required maintenance. Its innovative variable stator vanes increased compressor air pressure and helped eliminate compressor stall. Variable-incidence stators allowed the single-shaft turbojet to develop high pressures similar to those of dual-shaft engines, but at significantly lighter weight. The introduction of the variable stator vane turned out to be one of the most important developments in the history of jet aircraft engines. More than 17,000 examples of the J79 were built in its thirty-year production run. In its long and successful career the dependable J79 accumulated well over 30 million flying hours and probably clocked more supersonic flying time than any other Western military aircraft engine produced during the Cold War. It was widely used on several types of aircraft, including the McDonnell Douglas F-4 Phantom II, Convair B-58 Hustler, Lockheed F-104 Starfighter, Israeli Aircraft Industries Kfir, and North American Rockwell A-5 Vigilante. It was just over seventeen feet long, slightly more than three feet in diameter, weighed around 3,500 pounds, and produced around 9,000 pounds of dry thrust. In full afterburner the YJ79 generated around 15,000 pounds of thrust with a fuel flow rate of ten gallons per second. Later versions of the J79 weighed anywhere from 3,500 to 3,800 pounds and produced up to 17,900 pounds of thrust in full afterburner. This engine was chosen by Kelly Johnson to power his design of F-104 Starfighter. 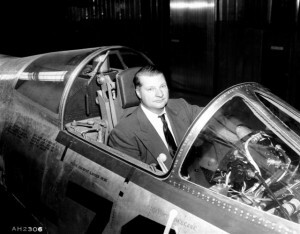 Kelly Johnson joined Lockheed Corporation in 1933 as a tool designer. After assignments as flight test engineer, stress analyst, aero-dynamicist, weight engineer, and wind tunnel engineer, he became Chief Research Engineer in 1938. His original and creative thinking led to the development of many innovations in the aerospace industry. He contributed significantly to 40 different Lockheed airplane designs. Of these, 19 were primarily Johnson products, some of the best known aircraft in the world; the Hudson bomber, the Constellation and Super-Constellation transports, the P-38 fighter, the T-33 trainer, the F-94 interceptor, and the Jetstar. The first U.S. production jet, the F-80 Shooting Star which made its initial flight in 1944, set a pattern for Johnson and his co-workers. Managing Lockheed’s Advanced Development Projects Division (The “Skunk Works“), he developed the first double-sonic U.S. jet, the F-104 Starfighter, the high flying U-2 spy plane, and the super fast Mach 3 SR-71 Blackbird. During the Korean Was, Lockheed whisked Johnson to war-zone forward air bases in Korea to talk to fighter pilots as they returned from their missions against the Soviet fighters flown by the north. What did they want in a new fighter aircraft? The answer was simple: speed and altitude. Appropriately, Johnson’s response was also simple. Build a pilot’s fighter which did not compromise on performance, one which could outmatch anything in the Soviet arsenal including the MiG-15. The resulting design would carry one powerful, multi-barreled gun, a simple radar gun sight, a pair of the new heat-seeking Sidewinder missiles then under development for the US Navy, be powered by a single, potent engine and fly higher and faster than anything in service anywhere. What’s more, it would be affordable. Ultimate performance for the new fighter meant low drag and high power. Abandoning the swept-wing twin-engine concept of the Lockheed XF-90 which had been developed from the massive German research data captured by the Allies at the end of world war II, the Skunk Works team settled upon a straight wing of very slender section. Its exceedingly thin leading edge and minimum camber would decrease shock waves and give relief from the weight and complexity of swept wings. However, the wing would have to be considerably thinner than five per cent, and the only answer to producing such a thin, straight wing was to make it extremely short. It had incredibly small knife-edged wings, sharply drooped to improve stability, a long, needle-nosed fuselage, a tall “T” tail, and open, half-circle intakes behind the cockpit. It was so futuristic in appearance it was soon dubbed by the Lockheed marketing department, “the missile with a man in it”. The shortness of the wing also enabled the aircraft to reduce drag. In order to achieve a better low speed performance for the wing, Lockheed engineers installed wing-leading edge as well as trailing-edge flaps. The function of these flaps was to convert the thin airfoil into a highly cambered one for better take-off and landing operations. A newly designed Boundary Layer Control System (BLCS) was installed of the F-104. The BLCS allowed the aircraft’s wings to delay flow separation at full flap setting and helped to increase the aircraft’s lift capacity, using high pressure bleed air blown over the trailing edge of the wing. The F-104 was one of the few aircraft in aviation history with more engine thrust than aerodynamic drag. This margin of thrust gave the F-104 it’s high speed capability and altitude performance. It also invested the aircraft with an uncanny ability to ascend at a steeper angle and with a higher climb rate than anything else in the skies. 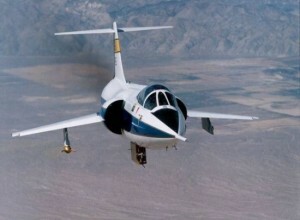 The climb rate was one of Johnson’s primary concerns in developing the Starfighter. He and his team designed the F-104 with the ability to intercept targets at an impressive climb rate of 60,000 ft per minute, with a fully loaded aircraft. This rate could be achieved with speeds in excess of Mach 1.7, the original profile requirement, without the aircraft losing overall forward speed. Overall speed and climb rate for the F-104 could only be achieved with the utilization of a massive power plant. The F-104 was fitted with a General Electric J79 engine capable of generating 15,800 pounds of thrust at sea level. It was a massive structure that weighed 3,500lb and was 17′-3″ in length. Due to the adjustable pitch of the guide vanes and its power, the howling noise of the jet engine was quite unique. The video link below gives you a sense of its sheer power and speed. When Khruschev threatened to drop a nuclear bomb on Peshawer after the U-2 incident, PAF acquired a dozen F-104s to protect the city from high flying Soviet bombers. 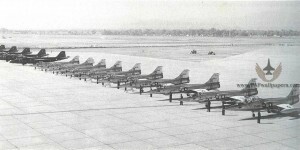 At PAF’s request, all its F-104As were refitted with the M-61 Gatling 20 mm gun, whereas its counterparts in the USAF had been divested of their guns on the assumption that all post-Korea air combat would occur at high speeds where only the wing tip-mounted Sidewinder missiles would be effective. The PAF’s foresight was amply rewarded in actual combat and the USAF too reverted to having machine guns as mandatory equipment on all its fighters in due course. The newer GWE- J-79-11 engine was also installed on the aircraft. This made the Pakistan F-104s somewhat unique: they had the gun and being the lightest of F-104 series with a more advanced J-79 engine enjoyed the best thrust-to-weight ratio. The only PAF unit to be equipped with the F-104 was No 9 Air Superiority Squadron. The squadron flies the F-16 today. The in-commission rate of the F-104 during the first five years of service was over 80 % and all its systems performed with high reliability. The fighter was employed in the air-to-air role by the PAF and was used extensively for aerial gunnery against both banner targets and the Dart targets with excellent scores. In strafing attacks the M-61 gun was superbly accurate. 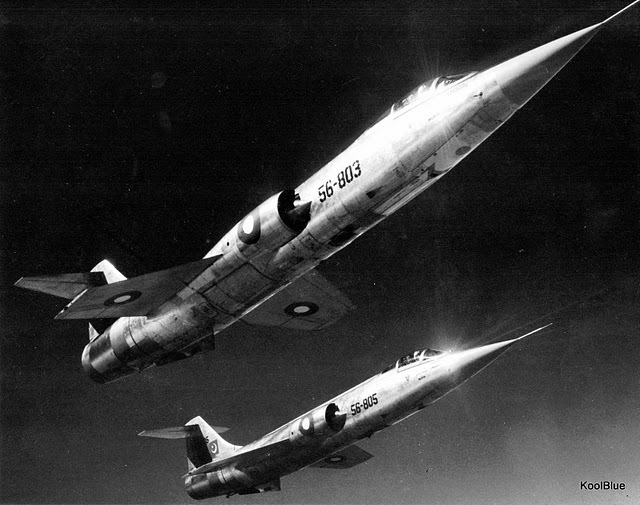 The F-104 Starfighters remained in service with Pakistan Air Force for twelve years and flew 11,690 hours. During the 1965 Pakistan-India War, the F-104s flew a total of 246 hours and 45 minutes while during the 1971 War, the F-104s flew a total of 103 hours and forty-five minutes. My personal experience of watching the speed and sound of F-104 happened in the mid 60s when PAF provided an air display on Pakistan Day at Peshawar Air Base. Many of the jets were lined up on the airfield on a crisp cool morning. To demonstrate the high altitude intercept capability, an intruder B-57 was sent up first. After some other demonstrations it was announced that the intruder has been detected and two F-104 thundered near vertically off the run way. Soon after the contrails of the intruder and two much faster contrails of F-104s performing an intercept could be visibly seen by the awed spectators. This is a personal account of the crucial role played by the dozen F-104 Starfighters of the Pakistan Air Force (PAF) in the Indo-Pakistan War of September 1965. The Indian Air Force (IAF) had then approximately 900 aircraft against PAF’s total of only 150. To win the battle for air superiority against these odds was a daunting task. Losing air superiority would have meant that Pakistan would have had to face the full might of the IAF, the consequences of which would have been disastrous. It was therefore imperative, that the PAF won and kept control of the air. Sqn Ldr Sadruddin and Flt Lt Middlecoat landed the first Starfighters at PAF Base Sargodha in 1962. In the following months, Pakistan inducted a total of 10 F-104A and two dual seat F-104B training aircraft in No 9 Squadron. These were USAF F-104C aircraft refurbished and updated with the latest J-79-11A engine, and upward ejection seats. Equipped with the M-61 Vulcan six barrel gun, the AIM-9B Sidewinder missile and the AN/ASG-14T1 fire control system, the aircraft was designed for high altitude (above 5000 feet), day /night interception/combat. Pakistan was the first country in Asia to induct a Mach 2 aircraft into its airforce. While most countries in Europe were still flying subsonic aircraft and none in Asia had an aircraft of this class and technology, many in Pakistan and abroad were skeptical of the PAF’s ability to fly and maintain this advanced system. The PAF’s flying skills, technological prowess, and competence, were soon proven. The pilots and ground crew of No.9 Squadron, who had been handpicked from F-86 squadrons, became the envy of the PAF by gaining mastery of the aircraft. To be part of No.9 Squadron, the cream of the PAF, was a great honour and privilege. In 1964 I was lucky to be given this honor. Sqn Ldr Jamal A Khan, the Squadron Commander was a very dedicated officer who set and maintained high standards. Training and flying in this Squadron was hard work. Safety always came first. The J-79-11A engine was sophisticated and complicated. It had inlet guide vanes in front of the engine, and a variable nozzle system in the rear. These were liable to fail, but the PAF maintenance crew had mastered the equipment. We only had one engine flame out, and the pilot Flt Lt Khalid managed to make a ‘dead stick’ landing. This was a difficult maneuver requiring precise judgement. The pattern was flown at 240kts and the landing flare started 300 ft above ground level, to make a touch down at 190 kt, on a 9000 feet long runway. Only one F-104 was lost during training -- a training air combat sortie -- in which Flt Lt Asghar ‘pitched up’, and went into a spin. He ejected safely at high speed, and received major bruises. The aircraft was replaced under the MAP program. Operational training was fun. Flying at Mach 2 was an incomparable experience. The thrill of coming under radar control, attacking F-86 formations, that were denied radar help, was a fighter pilot’s dream come true. The F-104 zoomed out of nowhere, and before the F-86 pilots could start their defensive maneuvers, the F-104 had completed its simulated missile launch and was breaking off. Early in 1965, warlike activity started in the disputed territory of Indian held Kashmir. Air Vice Marshal (AVM) Nur Khan had taken command of the PAF, just before the war. These were the days when we would be briefed daily, ‘under no account should any IAF aircraft be pursued across the border, if an aircraft is shot down, the wreckage must fall within Pakistani territory’. This was done to ensure that India would not be provoked into escalating to an all out war. All the concentration was along the disputed territory of Kashmir. On 3rd September 1965 an IAF Gnat was flying over Pakistan, on its way to its home base. A lone F- 104 was vectored to intercept the aircraft. Closing in at supersonic speed, the F-104 crossed the Gnat. There was no chance of making a successful intercept. But the Gnat pilot, probably thinking that there were more aircraft in the area, promptly lowered his gears and landed at a disused Pakistani airfield below, and surrendered himself. At that time, few thought that there was any chance of a real war breaking out. Life went on as usual. The routine was that a daily morning Combat Air patrol (CAP) would be airborne well before dawn. The F-104 formation would climb to 30, 000 feet, patrol the area near Kashmir and land back one hour after sunrise. The balloon went up on the morning of 6th September 1965. I got airborne with my wingman on a CAP mission. We climbed out under radar control, and were directed to the border near Kashmir. I was informed that the IAF had crossed the Pakistani border and were attacking ground positions approximately 80nm south of us. This meant that India had actually decided to start an all out war. We were immediately vectored to the area, and were soon over the site where the Indian aircraft were attacking. While dawn was breaking at 15,000 feet, it was still dark down below. I asked for permission to descend to ground level, but was denied. The reason given was that radio contact would be lost. I, however, decided to descend and leaving my wingman at 15,000 feet, to act as radio relay, I dove down and headed towards some flashes. As I reached the area, I was surprised to see that I was flying head-on into a formation of four IAF Mystere IV aircraft that were attacking ground targets. I was shocked more than I was surprised, as I felt a wave of anger leap through me. I had to shoot down these aircraft. I jettisoned my external fuel tanks and started to engage the Mysteres, as they turned into me. Maneuvering started at tree top level. I kept my eyes ‘glued’ on the target. I could feel the strain, under high ‘G’s’, looking over the tail of the aircraft, keeping the enemy in sight, and skimming the trees at high speed. One mistake, and I would have hit the ground. If I had lost sight of the Mysteres, the fight would have been over. The F-104, with the afterburner blazing, at low altitude, was responding very well. I used the high speed take -off Flaps to improve the turning capability as required. The ‘Stick Shaker’ was a big help, in flying the aircraft to its limit. The Mysteres would have no problem keeping the F-104 in sight because of its afterburner. After some hectic maneuvering, I was positioned behind two aircraft, but the other two were still not visible. I then spotted them, further ahead. Joy leapt through me; I armed my weapons, and decided to shoot the first two with missiles and the next two with guns. I fully realized that a confidential order prohibited me from using the missiles below 10, 000 ft. However, I was sure the missiles could be used effectively at any height, provided the targets could be discriminated from background heat sources. A distinct increase in missile tone ensured this. 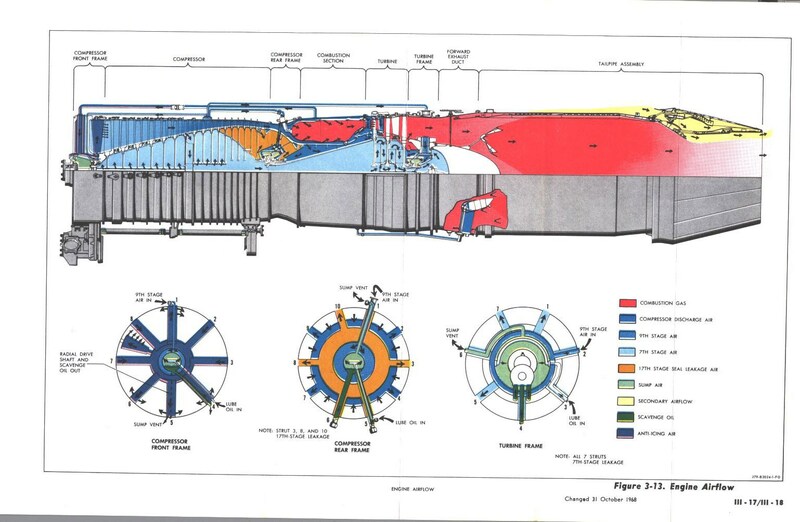 I set the wingspan of the Mystere IV, and started to recall the missile-firing checklist. ‘Check Range’, ‘Check Tone’, ‘Check G’s’, ‘Squeeze the trigger and hold’. I aimed the missile at the nearest aircraft, and heard the loud pitched missile tone. The sight indicated that I was in range. With all other requisite firing conditions met, I squeezed the trigger, and kept it pressed. I waited, only to note that the missile had not fired. As I looked towards the left missile, I saw a big flash, and the missile leaving the aircraft. The missile had taken, as stipulated in the manual, approx. 8/10ths of a second to fire after the trigger had been pressed but in combat, this seemed like an eternity. The flash of the missile blinded me for a few seconds. The radar controller who was also monitoring the radio of the Mystere’s, immediately informed me that one Mystere had been shot down and that another had been damaged. I was then at once instructed to turn right and pick up visual contact with the other Mysteres, which were exiting. I turned as directed but could not see them. On landing back, I was informed that the dog fight had taken place overhead the Rahwali Airfield where a low powered radar was located. The Mystere’s wreckage had fallen close by; the other three had gotten away. It gave me great satisfaction and amusement to think the effect that would be created on the IAF when the tale of the encounter with, ‘the F-104′ was narrated by the pilots who got away. To quote Hussaini, the PAF’s official aviation painter, ‘Apart from being the first encounter to start the war in earnest, the engagement was also significant in other respects. It marked a new era in dogfighting at very low altitude. It was also the first combat kill by any Mach 2 aircraft and the first missile kill for the Pakistan Air Force’. Moreover, it was also proven that the F-104 and the Sidewinder missile were an effective weapon system at low altitude. India had launched a full-scale attack, and we were now at war. India had the advantage of the aggressor, but had failed to take advantage of the ‘first strike’. The PAF now had to counter attack. The Air Chief arrived on the base. As I saw him he looked confident, and very aggressive. He was a genius; his planning was only surpassed by his boldness in execution. He had to fight 900 Indian aircraft with his 150. What could he do? The odds were impossible. He immediately gave instructions to reconnoiter (recce) the forward IAF air bases of Halwara and Adampur with the F-104. The pilots returned to report that the airfields had a full compliment of aircraft. He then enquired how many aircraft were available for a ‘dusk attack’. He was told that only seven F-86’s were serviceable. He ordered four to attack the IAF Base of Adampur, and three to attack Halwara Air Base. The plan appeared absurd. Attacking an airfield with only four aircraft and three aircraft respectively, after a recce .The enemy would be waiting. The attack was sure to fail. Subordinate commanders tried to convince the Chief to withdraw the order. None of us could appreciate the reason behind his logic. Command is lonely, and it takes courage to stand by one’s convictions. The Chief stood firm. The ‘dusk attack’ was launched. Of the seven PAF F-86 aircraft that took part in the ‘Dusk Strike’ two were shot down. The PAF kept attacking the IAF bases all night with B-57 bombers. The Air Chief hoped that the IAF would retaliate next morning, and attack the main PAF fighter base Sargodha that was 90 nm from the border. Radar was not effective at low altitude; therefore, the PAF had a string of Mobile Observer Units (MOU’s), that could plot and report low flying aircraft in Pakistani territory. Since the IAF attack was expected at low level, it would not be a surprise for the PAF. The only question now was, whether the IAF would take the bait, and attack Sargodha. Early next morning, on 7th September 1965, a large number of PAF F-104 and F-86 aircraft set up a Combat Air Patrol (CAP), over /near Sargodha, waiting for the enemy to attack. The F-104s were assigned the outer perimeter, while the F-86s were kept closer to the airfield. The Mobile Observer Units started to report the incoming intruders as they crossed the border and headed for Sargodha. The anti-aircraft guns opened fire as the first group of attacking aircraft came in. Surprisingly, these planes got through, without being intercepted. The next attack was picked up by Flt Lt Arif Iqbal in a F-104, and as he was about to fire, he suddenly saw an F- 86 flight appear between him and the enemy, and shoot down the Mystere. The attacks then came wave after wave, each one being intercepted, mostly by F-86’s, because they were positioned closer to the airfield. Flt Lt Amjad, in a F-104, shot down a Mystere, only to fly into the debris of the exploding aircraft. He ejected safely. By noon all attacks had ceased. The ‘Battle for Sargodha’ had been won. Never again in this war did the IAF venture to attack Sargodha in daytime. AVM Nur Khan had scored; the genius and courage of his plan had worked, his main air defence assets were safe. The pilots of No.9 Squadron competed fiercely, to undertake as many combat missions as they could. Never missing a chance to close with the enemy, hungry for combat. 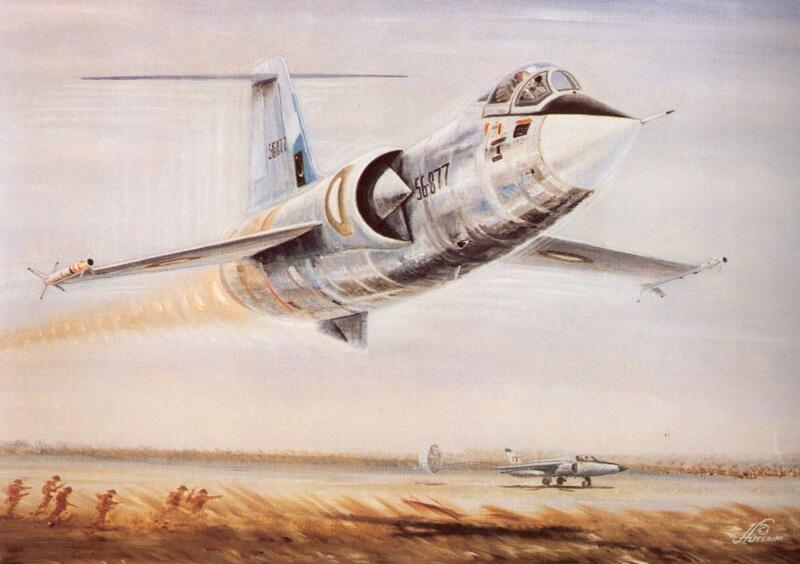 In the days that followed, the F-104 pilots noted that whenever they got airborne, the IAF grounded all its aircraft. This made it very difficult for the F-104 pilots to engage the enemy during daytime hours. Flt Lt Mushtaq, my brother, flying a F-104 in the same Squadron, made contact with the enemy, only to note that as he approached the target, the IAF Hunters disengaged well in time. Flt Lt ‘Micky’ Abbas in an F-104 had a similar episode. This experience would be repeated for the F-104 pilots for all daytime interceptions. I personally patrolled in a lone F-104, at 30,000ft, deep inside Indian territory, over the two Indian fighter airfields of Adampur and Halwara for one hour, and there was no response from the Indian side, no IAF fighter aircraft were scrambled to engage the intruder leisurely loitering over Indian airbases. This was total air superiority, and it displayed the complete and utter supremacy the Starfighter enjoyed over the IAF. At medium and high altitudes the F-104 ruled the sky. The IAF refused to challenge the Starfighter, keeping at a safe arm’s length distance from challenging it. But below 5000ft, a fierce battle raged between the F-86 and the IAF fighters, mainly the Hunters and Gnats. The F-86 was the workhorse of the PAF, it was under-powered, outnumbered, and out-gunned. Nevertheless, the F-86 pilots showed great courage as they fearlessly engaged their opponents, and displayed an unusual skill for air combat, achieving an excellent kill ratio. The F-104 by controlling the sky at medium and high altitude, had reduced the workload for the F-86 ‘s to the extent that the disparity in numbers was manageable. The F-86’s could now hold their own against the enemy at low altitude. 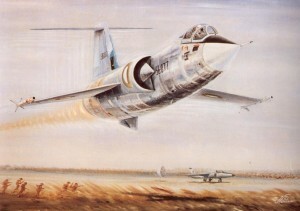 The F-104/F-86 team had won the battle for the air. The PAF had fully established air superiority. The job had been done; numbers did not matter now. The will of the enemy to fight the F-104 had been broken. It was a tremendous contribution by the F-104 in the war effort. The Starfighter reigned supreme. It had played a pivotal role in the defense of Pakistan, and the battle for air supremacy by the PAF. Pakistan got the better of the IAF, with odds of 1:6 or 150:900, and the PAF maintained Air Superiority, day and night. The genius and courage of Air Marshal Nur Khan and the F-104/F-86 team had made this possible. Undoubtedly, the F-86 was the workhorse, but the F-104 had a very special task. The PAFpilot/F-104 team had created a situation where the IAF pilots did not have the will to fight the F-104. When the F-104 was ‘UP’, the Indian Air Force was ‘Down on the Ground’. This removed a major portion of the threat. The Starfighter and its pilots had contributed immensely to achieve this victory. The pilots by flying and engaging enemy aircraft very aggressively, never losing any opportunity to engage the enemy, by day or by night. Working long hours, and flying under difficult flight conditions. The maintenance crew and the F-104 deserve a special accolade, ‘not one technical abort, or snag affected a mission’. The F-104 was flown by determined pilots, maintained by efficient crew and supported by dedicated radar controllers. This made a tremendous team, that helped win the battle for air superiority for the PAF. The F-104 Starfighter was in a class of its own-‘Superlative’, to say the least. Without the dozen Starfighters the outcome of the war might not have been so good. ‘It definitely was a pleasure, a great thrill, and the ultimate experience to fly the F-104 in Combat’. 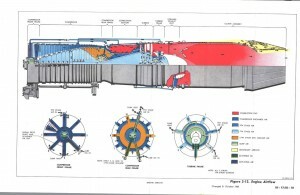 The point of this longish post is the elucidate the importance of the core competency achieved by this amazing engine. A dozen fighters equipped with this engine were able to dominate a much larger air force. While it is true that PAF pilots effectively mastered the art of flying a difficult plane and used it to its full potential, it can be argued that had IAF had this plane, they could equally well have had an upper hand. Kelly Johnson was able to wrap a plane around this engine to create a master piece, that could even today give any fighter a run for the money with the right avionics and weapons upgrades at medium and high altitudes. But this engine proved equally effective in Phantom, a plane not designed by Kelly. This lesson has been effectively applied by countries like Finland, Israel and Brazil. Finland has a disproportionate market share of cell phone market. Similarly Israel focused their investments in unmanned aircraft vehicles and are now reaping the benefits in this market of the future. Brazil competes on equal footing with US and European countries in the sales of business jets. Developing countries like Pakistan should focus on core technologies of the future so that they too can compete with the best and reap the benefits. Pakistan also has many competent and inovative people like Kelly Johnson. While USA allows and encourages such people to materialize new ideas, Pakistan on the other hand usually discourages such inovative people. I don’t know why but that is the Pakistani psyche! Nevertheless, Pakistan, to its credit, superbly utilized some one elses technology. Very interesting. I had a ride on F 104 with my student Middlecoat who was Wng. Cdr. then Commanding 9 Sqn . On take off by the time I retracted the undercarriage we were over Sakesar. It was a rocket with wings, designed to shoot at high altitude Russian Strategic Bombers requiring little maneuvering. In one air display at Peshawer, Middlecoat did a low very wide steep turn, I asked about it being so wide he said he was already pulling 7 Gs, speed was high. A truly wonderful article about a wonderful aircraft. I was a fighter controller in both 65 and 71 wars and controlling the F-104 was a thrill—perhaps not as much as flying it. Once we had a pair of F-104s, we seemed to continue for ever, it had so much endurance. unlike the F-86, F-104 could have radar contact with the target at 10 miles. what Aftab did not mention was the day time daring low level recce he flew over an enemy base. The base had been attacked at night and we were desperately wanting to know the damage done. Aftab came up with the idea to fly inverted at high speed, low lever over the base with another pilot in the rear seat with a simple hand held camera, since F-104 was not equipped for recce. The mission went like a dream and within two hours the pictures were ready for observation–that was the F-104 in the PAF. that I was making was different than complete coverage of F-104 history with PAF. I recall there was a J79 version of F-16 (F-16/79) that the US had considered in the late 70s/early 80s to its non-Nato potential allied customers and Pakistan may have been offered this version first. This was also the primary variant that was on offer to some middle eastern countries, including Bahrain. But it never got past the prototype stage. No country wanted to have less capable version of the F-16 and both Pakistan and Bahrain got the real deal. It is interesting to think that if it had taken off, it would have been another aircraft that the engine would have been on and in service. 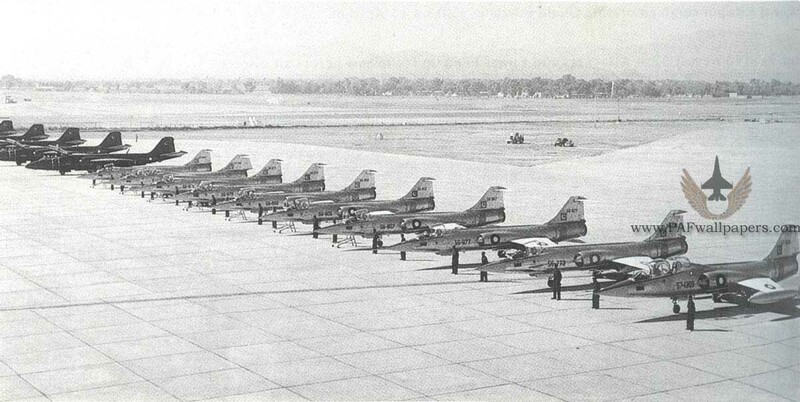 As for the F-104, by the time I was old enough to enter a base, these airplanes were already out of service in Peshawar awaiting transfer so I never got to see them fly till I saw one for a private air display team in the US at an air show.